Be the first to share your favorite memory, photo or story of Jay. This memorial page is dedicated for family, friends and future generations to celebrate the life of their loved one. Jay K. Beard, 91, of Erie, passed away at 1:32 p.m., Saturday, February 2, 2019 at Labette Health in Parsons. He was born on April 9, 1927 at Erie, Kansas to Don and Thekla (Janssen) Beard. He grew up at Erie and attended country and Erie schools graduating from Erie High School in 1944. Jay served in the United States Merchant Marines from 1944 to 1950 when he then enlisted in the United States Army from 1950 until his honorable discharge in 1952. Jay and Darlene Hoppas were united in marriage on May 13, 1951 at the Federated Church in Erie. She survives of the home. He attended California State Polytechnic College at San Luis Obispo where he graduated with a Bachelor of Science degree in Mechanical Engineering. Jay worked at the Shell Oil Company and lived and traveled across the western United States for over 26 years and retired in 1983 as a Production Manager. In his retirement he lived in Bakersfield and Camarillo, California and Jay worked as a consultant to the oil and gas industry. He recently moved back to Erie. Jay enjoyed hunting while he lived in Utah, golfing, traveling, and visiting family. 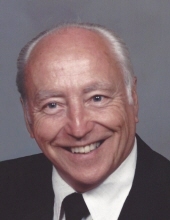 He was a member of the Federated Church in Erie and attended church while he lived in Bakersfield and Camarillo. He was also a member of the American Petroleum Institute and the American Legion in Camarillo. In addition to his wife, Jay is survived by his daughters, Lori Swendseid, and her husband, Chris of Las Vegas, NV and Shaila Beard of San Jose, CA; his grandchildren, Erik Swendseid, and his wife, Courtney of Las Vegas, NV and Keri Newbrough, and her husband, Hunter of Reno, NV; his great-grandchildren, Austin, Lainey, and Adelaide; several nieces and nephews. He was preceded in death by two brothers, Verne Beard and Bill Beard; and two sisters, Ada Sanders and Mary Volmer. To send flowers or a remembrance gift to the family of Jay K. Beard, please visit our Tribute Store. The family will receive friends at the funeral home from 6 to 7 Thursday evening at the funeral home. Funeral services will be held at 2 p.m., Friday, February 15, 2019 at the Pierce-Carson-Wall Funeral Home with Pastor Mark Demas officiating. Burial will follow in the East Hill Cemetery. "Email Address" would like to share the life celebration of Jay K. Beard. Click on the "link" to go to share a favorite memory or leave a condolence message for the family.